If you know me at all then you know that The Pen Addict was not created around 0.7 mm roller ball pens. It is sub 0.5 mm or bust around here, and the majority of pens I review that are 0.7 mm or wider are usually just that. Not this Retro 51 Tornado. I have seen the top of the mountain, and it is good. I have known of Retro 51 pens and pencil for years, but until JetPens started carrying them I never had the opportunity to try one. Even then I was hesitant, but the classic barrel design drew me in. The Classic Lacquers Series feature a stainless steel body with a high gloss lacquer overlay. This makes all of the barrel colors in the series really pop. The knurled twist-top is the very definition of +1. As beautiful as the barrel is, the quality of the refill is going to make or break the pen. I had zero expectations that it was going to work for me, but I am continually impressed by it. The tip is very smooth and, most importantly, the ink does not bleed like many 0.7 mm cartridges do. Is there some bleed? Sure, it is inevitable with this size tip and liquid ink. But compared to many other similar refills it is superior, at least in my non-scientific mind. Does anyone else feel the same way about this refill and how this pen writes, or am I delusional? To me, it is better than any other similar refill I have tried. It is a telling sign that I keep my orange Retro 51 within arms reach among the jungle of 0.3 mm gel ink pens on my desk. 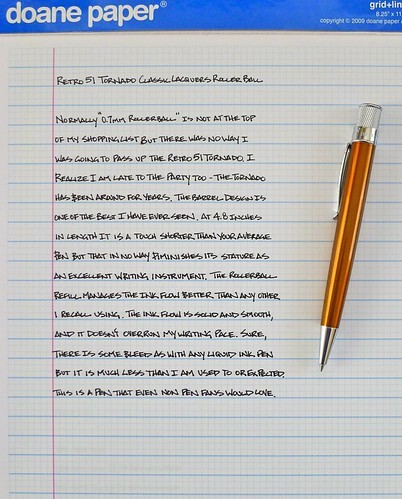 Posted on January 30, 2012 by Brad Dowdy and filed under Pen Reviews, Retro 51, Rollerball.